IMMANUEL IN HEBREW, EMMANUEL IN GREEK(ROMANIZED)…SEE THE DIFFERENCE OF “I” AND “E“. THE EVERLASTING FATHER, MIGHTY GOD, GOD IS WITH US!! WAS BORN PROPHECY FULFILLED. SO THE CHILD IS THE “MIGHTY GOD” NOT “MIGHTY MAN”. EVERLASTING “FATHER” NOT EVERLASTING “SON”. 23 Behold, a virgin shall be with child, and shall bring forth a son, and they shall call his[[ name ]] Emmanuel, which being interpreted is, GOD IS WITH US. SO IT WAS VERY CLEAR THE THE CHILD IS THE GOD OF OLD TESTAMENT WHO MANIFEST IN THE FLESH. HE IS THE GOD OF OLD TESTAMENT WHO BECOME MAN. YAN ANG ITINAWAG SA KANYA. 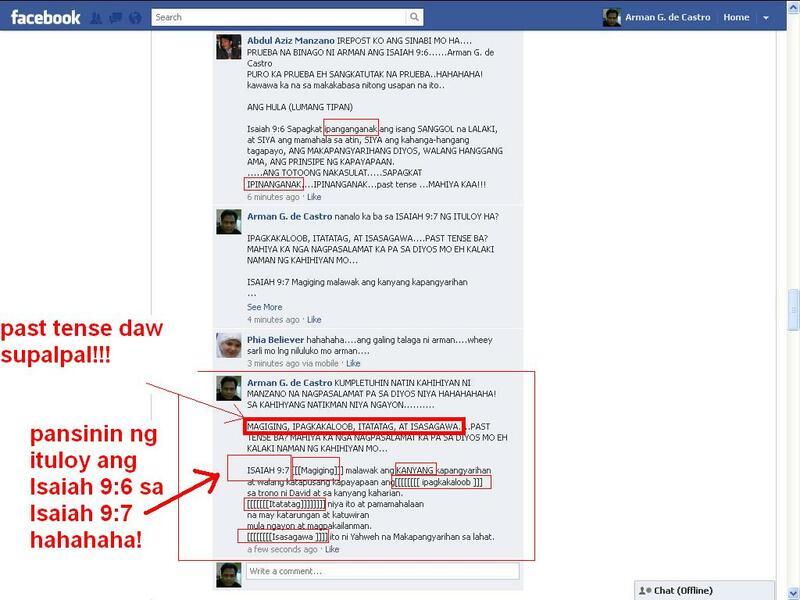 MAY MGA NAGTATANONG BAKIT DAW HINDI EMMANUEL ANG PANGALAN BAKIT YESHUA/JESUS ANG NAGING PANGALAN. KASI NGA PO TANDAAN MAGKA-IBA NG TATAWAGIN SA PAPANGALANAN. Isaiah prophetically referred to Jesus the Messiah as “Mighty God.” (Isaiah 9:6) At Isaiah 10:21, the same prophet spoke of Yahweh/Jehovah as “the Mighty God.” Some try to use this similarity of wording to prove that Jesus is God. But we need to be careful about reading too much into these verses. The Hebrew expression rendered “Mighty God” is not limited to Jehovah as is the expression “God Almighty.” (Genesis 17:1) Admittedly, there is a difference between being mighty and being almighty, with no superior. According to Isaiah 43:10, Jehovah said: “Before me there was no God formed, and after me there continued to be none.” But those words do not prove that Jesus is God. The point is that Jehovah had no predecessor, that no god existed before him, for he is eternal. There will be no god after Jehovah because he will always exist and will have no successors as the Supreme Sovereign. Yet, Jehovah did produce others that he himself called gods, as the Scriptures show by saying concerning certain humans: “I myself have said, ‘You are gods, and all of you are sons of the Most High. Surely you will die just as men do; and like any one of the princes you will fall!’” (Psalm 82:6, 7) Similarly, the Word was a god created by Jehovah, but that did not make Jesus equal to Almighty God at any time. Those who claim that God took on human existence as a God-man should note that the Bible does not even hint that Jesus viewed himself in such a way. Rather, it consistently shows that Jesus has always been inferior to his Father. When on the earth, Jesus never claimed to be more than the Son of God. Moreover, Christ said: “The Father is greater than I am.”—John 14:28. Paul made a distinction between Jehovah and Jesus in saying: “There is actually to us one God the Father, out of whom all things are, and we for him; and there is one Lord, Jesus Christ, through whom all things are, and we through him.” (1 Corinthians 8:6) Paul also said: “You belong to Christ; Christ, in turn, belongs to God.” (1 Corinthians 3:23) Indeed, even as Christians belong to their Master, Jesus Christ, so he belongs to his Head, Jehovah God. Making a similar point, Paul wrote: “The head of every man is the Christ; in turn the head of a woman is the man; in turn the head of the Christ is God.” (1 Corinthians 11:3) This relationship between God and Christ will continue, for after Jesus’ Thousand Year Reign, “he hands over the kingdom to his God and Father” and “the Son himself will also subject himself to the One who subjected all things to him, that God may be all things to everyone.”—1 Corinthians 15:24, 28; Revelation 20:6. Regarding Jesus’ birth, Matthew wrote: “All this actually came about for that to be fulfilled which was spoken by Jehovah through his prophet [at Isaiah 7:14], saying: ‘Look! The virgin will become pregnant and will give birth to a son, and they will call his name Immanuel,’ which means, when translated, ‘With Us Is God.’” (Matthew 1:22, 23) Jesus was not given the personal name Immanuel, but his role as a human fulfilled its meaning. Jesus’ presence on the earth as the Messianic Seed and Heir to David’s throne proved to Jehovah’s worshipers that God was with them, on their side, backing them up in their undertakings.—Genesis 28:15; Exodus 3:11, 12; Joshua 1:5, 9; Psalm 46:5-7; Jeremiah 1:19. Addressing the resurrected Jesus, the apostle Thomas exclaimed: “My Lord and my God!” (John 20:28) This and other accounts were “written down that [we] may believe that Jesus is the Christ the Son of God.” And Thomas was not contradicting Jesus, who had sent His disciples the message: “I am ascending to . . . my God and your God.” (John 20:17, 30, 31) So Thomas did not think that Jesus was Almighty God. Thomas may have addressed Jesus as “my God” in the sense of Christ’s being “a god,” though not “the only true God.” (John 1:1; 17:1-3) Or by saying “my God,” Thomas may have been acknowledging Jesus as God’s Spokesman and Representative, even as others addressed an angelic messenger as though he were Jehovah.—Compare Genesis 18:1-5, 22-33; 31:11-13; 32:24-30; Judges 2:1-5; 6:11-15; 13:20-22. CERTAIN translations of Hebrews 1:6 say: “Let all the angels of God worship him [Jesus].” (King James Version; The Jerusalem Bible) The apostle Paul evidently quoted the Septuagint, which says at Psalm 97:7: “Worship Him [God] all ye His angels.”—C. Thomson. The Greek word pro‧sky‧ne′o, rendered “worship” at Hebrews 1:6, is used at Psalm 97:7 in the Septuagint for a Hebrew term, sha‧chah′, meaning “to bow down.” This can be an acceptable act of respect for humans. (Genesis 23:7; 1 Samuel 24:8; 2 Kings 2:15) Or it can relate to worship of the true God or that wrongly directed to false gods.—Exodus 23:24; 24:1; 34:14; Deuteronomy 8:19. Usually pro‧sky‧ne′o given to Jesus corresponds with obeisance to kings and others. (Compare Matthew 2:2, 8; 8:2; 9:18; 15:25; 20:20 with 1 Samuel 25:23, 24; 2 Samuel 14:4-7; 1 Kings 1:16; 2 Kings 4:36, 37.) Often it is clear that obeisance is rendered to Jesus not as God but as “God’s Son” or the Messianic “Son of man.”—Matthew 14:32, 33; Luke 24:50-52; John 9:35, 38. Hebrews 1:6 relates to Jesus’ position under God. (Philippians 2:9-11) Here some versions render pro‧sky‧ne′o “pay . . . homage” (The New English Bible), “do obeisance to” (New World Translation), or “bow before” (An American Translation). If one prefers the rendering “worship,” such worship is relative, for Jesus told Satan: “It is Jehovah your God you must worship [form of pro‧sky‧ne′o], and it is to him alone you must render sacred service.”—Matthew 4:8-10. Though Psalm 97:7, which speaks about worshiping God, was applied to Christ at Hebrews 1:6, Paul had shown that the resurrected Jesus is “the reflection of [God’s] glory and the exact representation of his very being.” (Hebrews 1:1-3) So any “worship” the angels give God’s Son is relative and is directed through him to Jehovah. siya po tagapamahala sa atin.siya ang susi sa katutuhanan.kaya isa siyang propeta si hesus. [pbuh].juan;17;at ito ang buhay na walang hanggan,na inyong makilala ang nag iisang tunay na diyos,at si hesus[pbuh] na kanyang isinugo.1 timoteo 2;5.sapagkat may isang diyos at may isang tagapamagitan sa diyos at sa mga tao.ang taong si kristo hesus[pbuh].yan po maliwanag nakasulat.kaya hindi diyos si jesus. FOCUS IN WALANG HANGGANG AMA AT MAKAPANGYARIHANG DIYOS? 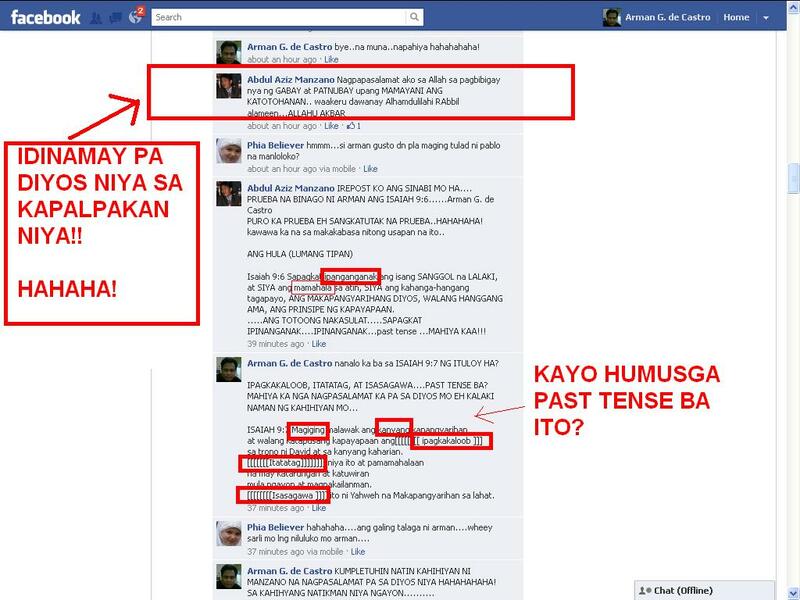 ILAN BA ANG EVERLASTING FATHER NA BINABANGGIT SA BIBLIA? INUULIT KO “EVERLASTING” FATHER. 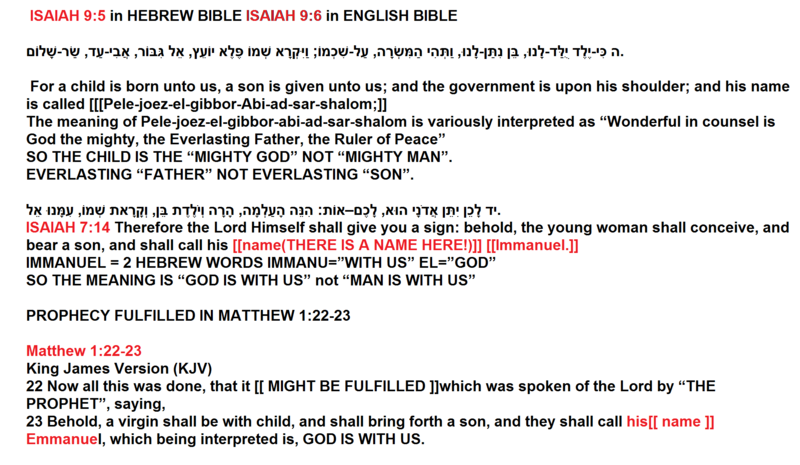 Isaiah 9:6 is another verse that is erroneously used by the Trinitarians who believe in the deity of Christ. Their belief stems from the segment of the prophecy about the “Son” which says, “And His name will be called Wonderful, Counselor, Mighty God, Everlasting Father, Prince of Peace”. However, this will be clarified later that Jesus Christ, who is the “Son”, is not the Mighty God referred to nor does this prophecy indicate His alleged divinity. “For a child is born unto us, A son is given unto us; And the government is upon his shoulder; and his name is called Pele-joez-el-gibbor-Abi-ad-sar-shalom.” (The Holy Scriptures According to the Massoretic Text, 1917 edition). The Hebrew name Pele-joez-el gibbor-Abi-ad-sar-shalom is translated in the footnote as, “Wonderful in counsel is God the Mighty, the Everlasting Father, the Ruler of Peace”. It is evident here that this is not a series of names as interpreted by some but just one long name. More importantly, we could clearly notice here that the “God the Mighty” or “Mighty God” referred to who is also “Wonderful in counsel” is none other than “the everlasting Father” Himself. Taking into consideration that Christ is the “Son” of the Father (Matt. 3:16-17), He therefore is not the Father Himself, hence, Christ is not the Mighty God. Therefore, although Christ is the fulfillment of the prophecy about the child, it does not mean that He is God. It is worthwhile to note that one’s state of being is not necessarily determined by the meaning attached to his personal name, much less by the meaning of the title of the government or authority he holds. Simon the apostle was named “Cephas” or “Peter” which means rock (John 1:42), and the apostles James and John, were named “Boanerges, that is, ‘Sons of Thunder’ ” (Mark 3:17). However, it doesn’t mean that Peter is himself a rock and that the other two are “sons of thunder”. Moreover, biblical names of persons such as Eliphelet (the God of deliverance) and Elihu (whose God is he [Jehovah]) and places like Elkosh (God my bow) and El-bethel ( the God of Bethel) [Smith’s Bible Dictionary, pp 163-167] also contain descriptions about God, but no serious theologian so far that those persons and places are God. THE EVERLASTING FATHER, MIGHTY GOD, GOD IS WITH US!! WAS BORN. conlude:the “SON” is same also as the “HE”?